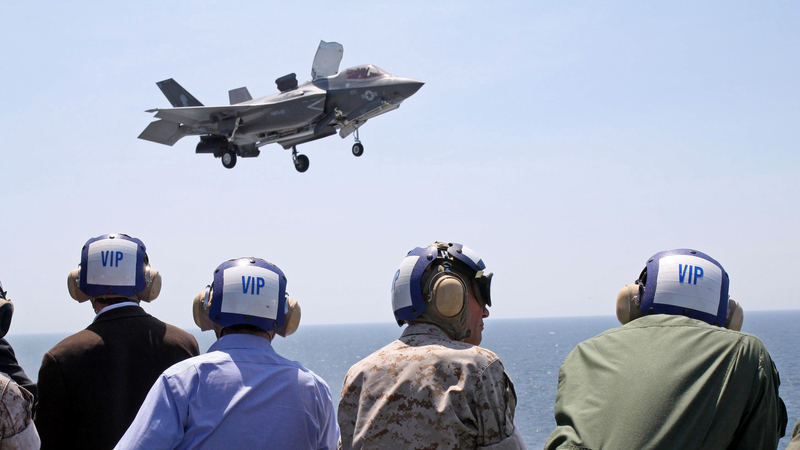 The Marine Corps declared initial operational capability on its variant of the Lockheed Martin F-35 Lightning II Joint Strike Fighter (JSF), after a final assessment showed the plane and its crew are not only ready to fight overseas if needed but also maintain and sustain the plane during extended operations. “I am pleased to announce that VMFA-121 has achieved initial operational capability in the F-35B, as defined by requirements outlined in the June 2014 Joint Report to Congressional Defense Committees,” Commandant of the Marine Corps Gen. Joseph Dunford said in a statement. The Marines’ fifth-generation fighter is the first of the three variants to reach IOC. The first squadron, Marine Fighter Attack Squadron (VMFA) 121, is scheduled to move to Japan in 2017, but technically now that IOC has been declared the squadron could be called upon for emergency operations at any time. Marine Corps Deputy Commandant for Aviation Lt. Gen. Jon Davis told USNI News earlier this month that he’d like to see the jets wait until 2017 before going overseas, to allow more time for more units to be stood up and for the training and logistics pipelines to mature. But he made clear he would not recommend that Dunford declare IOC unless he was confident the planes could be successful overseas today. The squadron went through operational testing aboard USS Wasp (LHD-1) in May, and in a first-ever step before declaring IOC for an American platform, Davis introduced an Operational Readiness Assessment as a final test to ensure the pilots, the maintainers and the logistics teams were ready to formally enter the fleet. Davis said his biggest concern was whether there were enough spare parts in the inventory to properly sustain the squadron’s 10 jets. He promised that, even though many people have assumed the Marines would declare IOC on time regardless of the planes’ performance in testing, he would not give his thumbs up until he was confident the spares were right. “The performance of the VMFA-121 during the ORI in all evaluated maintenance, flight operations, and exams was exceptional,” Davis said in a statement Friday. The U.S. Marine Corps’ F-35B Lightning II aircraft reached initial operational capability today with a squadron of 10 F-35Bs ready for world-wide deployment. Marine Fighter Attack Squadron 121 (VMFA-121), based in Yuma, Arizona, is the first squadron in military history to become operational with an F-35 variant, following a five-day Operational Readiness Inspection (ORI), which concluded July 17. Dunford stated that he has his full confidence in the F-35B’s ability to support Marines in combat, predicated on years of concurrent developmental testing and operational flying. As the future of Marine Corps tactical aviation, the F-35 will eventually replace three legacy platforms: the AV-8B Harrier, the F/A-18 Hornet, and the EA-6B Prowler. “The success of VMFA-121 is a reflection of the hard work and effort by the Marines in the squadron, those involved in the program over many years, and the support we have received from across the Department of the Navy, the Joint Program Office, our industry partners, and the Under Secretary of Defense. Achieving IOC has truly been a team effort,” concluded Dunford. The U.S. Marine Corps has trained and qualified more than 50 Marine F-35B pilots and certified about 500 maintenance personnel to assume autonomous, organic-level maintenance support for the F-35B. VMFA-121’s transition will be followed by Marine Attack Squadron 211 (VMA-211), an AV-8B squadron, which is scheduled to transition to the F-35B in fiscal year 2016. In 2018, Marine Fighter Attack Squadron 122 (VMFA-122), an F-18 Hornet squadron, will conduct its transition.